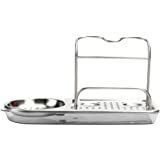 Enhance the look and function of your kitchen sink area, with this highly practical caddy. 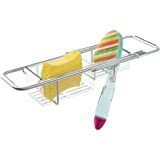 The main body of the unit provides ample space for storing a dish detergent bottle and dish brush, and the integrated rail provides hanging and drying space for damp dishcloths. A large draining plate within the base creates a dedicated area for placing wet sponges, and the concealed reservoir beneath the unit collects any drained water ready for disposal. The entire unit can be dismantled for easy cleaning. Dishwasher safe. Yeah.... I'm not a fan of this. The idea seemed great and it was what is was looking for but it seems to create more of a mess than anything. 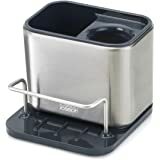 The caddy part fills with water and has to be emptied or else you have a soapy, watery reservoir, no there's no drain. And the outer part with the removable drain tray is shallow and fills rather quickly. I dunno, it just didn't work for me. 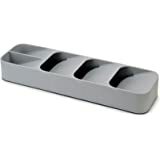 This is my review for Joseph Joseph Sink Caddy, Kitchen Soap and Sponge Holder, Dark Grey and Grey. 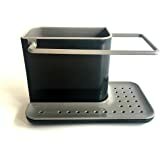 I bought this sink caddy because my top of my sink always looked unorganized and a hot mess. It would also get dirty and gross from laying wet stuff on top of it. So I decided to look for something that would serve my needs and wants. I seen this sink caddy and it looked like it would do the trick. So I immediately ordered it. 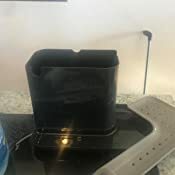 This sink caddy's dimensions are 8.9 x 4.7 x 5.5 inches. So it's rather small and can be set on top of the sink. It holds everything I need it to hold: Ms. Myers Dish Soap (round bottle), sponge, brillo pad, chain mill scrubber, Plastic lodge scrapper, and a lodge brush. 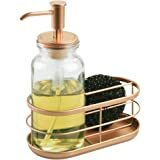 This Sink Caddy is really practical and it looks nice. It's made from plastic. It comes in two different colors shemes: gray and black or white and green. I got the gray and black. It can easily be taken apart for cleaning. It can even be put in the dishwasher if you wanted to. 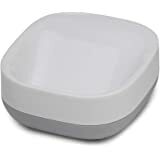 It has a drain plate within the base that creates an area for placing wet sponges and it's easy to take off to drain any water that collects underneath it in the reservoir. No issues with it smelling or any molding. This caddy is awesome and is probably one of the best I have ever used. I won't change a thing about it. Wonderful product! 5.0 out of 5 starsHit the Nail in the Head! 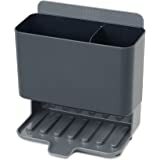 Let me start off by saying I scoured Amazon looking for a sink caddy that would work. I have a few baby bottle brushes, one of those dish scrubbers with a handle and then another that you fill with soap. I needed something that would be big enough to hold them all, still fit nicely in my sink area and wasn't horridly ugly. Bingo! 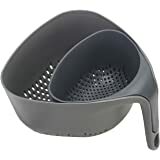 I love how this one doesn't drain water all over the place, but has the nifty little piece that comes off that you can just dump the water when needed. 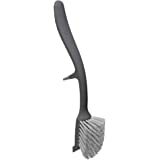 It has tons of room for my collections of cleaning brushes but isn't too big. Plus you can just pop it onto the top shelf of the dishwasher when it needs to be washed. I at first was going to make a cute little holder myself with a mason jar but then started thinking about how nasty it would get with any water that falls into it and of course it wouldn't be big enough for what I need. 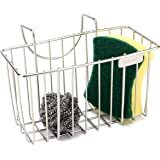 This one even has a place to hold a wash rag on the side and a regular size sponge fits nicely on the bottom. I definitely recommend this if like me, you have a collection of brushes that you need to get off your counters! 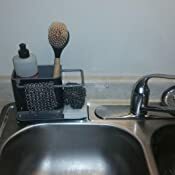 I always hated having to throw away or replace sponges or the replaceable sponge ends on dishwashing wands after trying to balance them on the sink to dry, constantly having to rebalance them after they would fall in dirty, smelly water. This handy little device is a must! 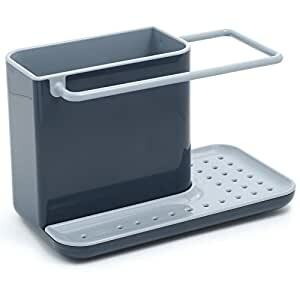 It was better than I even expected in that; it has a tray underneath that catches the water so sponges can sit on the bottom of it and still dry as the water falls through the holes into the tray underneath which easily detaches so it makes it super easy to clean. 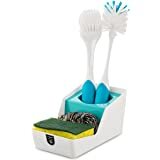 The compartments are different sizes so I put a small soap dispenser pump bottle in the big one and the slimmer one is perfect to hold up different style wash wands, or soap dispensing sponges so they can dry after washing. Additionally, there is the convenient bar around the top so you can hang and dry dish cloths as well. I would recommend to anyone and everyone who owns a sink and washes their dishes! 5.0 out of 5 starsTHIS IS A KEEPER! I don't know how many types of sink caddies I've bought over the years, but it's a lot. FINALLY - THIS IS ONE I WON'T BE THROWING AWAY. Not only does it look great, it actually works as a caddy should. I put a brush in the holder and lay my sink stopper against the front and my sponge against the side and it's perfect. 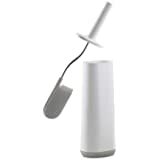 Its also super easy to empty any draining water and clean. I'd buy this again in a heart-beat. Hands down, this is the best sink caddy I've ever owned or seen. I bought this caddy for the back of my kitchen sink because I wanted a neater look. 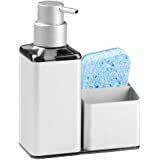 I always buy a Costco size dish detergent and just fill a hand soap dispenser with the dish detergent for ease of use (and it’s so much more economical this way). The hand soap dispenser fits nicely in the left compartment and my scrub brushes fit in the right. I wring out my sponge when I’m done and lay it in the space provided. It dries nicely overnight without any of that mildew smell because any extra water drains through the holes into the space below. I don’t use dish cloths so I haven’t used the towel holder, but it looks like it would be handy for this purpose. I wipe any excess water off the back of my sink when I’m done doing dishes so I’ve never had any water accumulation problems. The base of the caddy separates and the whole thing washes easily. 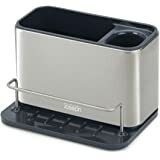 I have stainless steel appliances and black dish drying mats, so the grays in this dispenser nicely complement everything else. 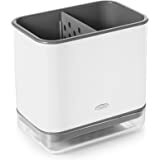 This is a great addition to any kitchen for helping to eliminate clutter. 4.0 out of 5 starsPretty well made, but plastic. Seems solid, but bar isn't very solid. Be careful what you hang on bar. I honestly love this caddy, but the handle will be very EASY to break! 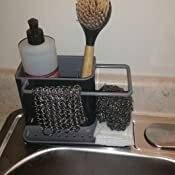 This is very well thought out and very easy to clean, holds everything well, but if you want to hang a wash cloth or something from the bar (I'd be very afraid of it breaking). They really needed to support the bar in the corner, but I understand it would lose the aesthetic look. 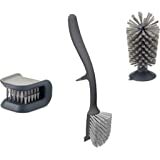 The gray bottom slides off easily for cleaning the water well, as well as having a cut out in the back for draining (or this could deter you from purchase, as if not drained, it may end up draining on your counter top). 4.0 out of 5 starsSimplify your sink! I love this Caddy. I can fit a bottle of 14 oz. 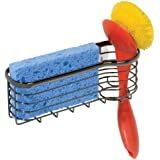 dish detergent, a scrub brush, a standard size hand soap, and a sponge. It keeps everything in one place and the plastic makes it easy to clean. For those who want to fit a bigger bottle, just buy the small bottle and when it's used up, buy a big bottle and refill the small bottle. 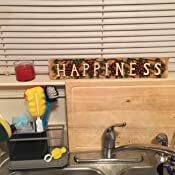 It keeps your sink neat and tidy.